About JAVA: Java is one of the programming languages that is object-oriented and it is intended to develop applications based on the principle “write once, run anywhere”. Java code is special programming language which works or runs on all platforms without the process of recompilation. Java programming applications are compiled typically to a byte-code which works on any Java Virtual Machines (JVM). Java was originally developed by James Gosling at Sun Microsystems, which is under Oracle Corporation and was released in 1995 as an important component of Sun Microsystems. So it is also called as Oracle Java. 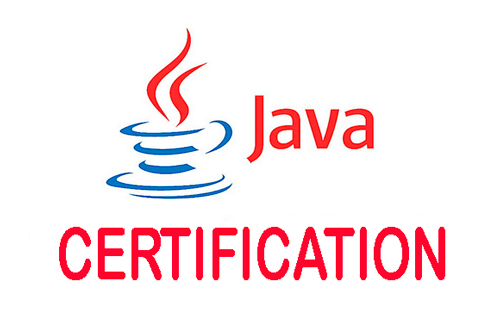 Read out complete article and know more info related to JAVA Certifications. Oracle Certified Expert, Java EE6 Java Enterprise Architect etc. For achieving Java 8 certification, one should complete the entry level examination of IZO-808 Java SE 8 Programmer 1 exam. After qualifying in the course, we can enter into Java 8 Certification program. And to attain Java 8 Certification, the syllabus can be teached during the course. Let’s look at the syllabus for Java 8 Certification. When Sun Microsystems came under the control of Oracle, Java Certifications are renamed as Oracle Certified Java Associate (OCJA) & Oracle Certified Java Professional (OCJP). These are helpful in acquiring broader knowledge. After the extension of Java 7, Oracle decided to split the courses into two professional courses i.e. Oracle Certified Associate Java Programmer (OCAJP) and Oracle Certified Professional Java Programmer (OCPJP). The new Java Professional Certifications are developed for the managers with an intention to understand the domain of Java programming. Java Certification course is a demanding course in and around India. Recently in India, after the establishment of various software companies, the demand for Java Certification went high. As it is a highly demanding professional course, the cost of the course might be high and vary according to the institutions. Let us see the fee structure of Java Certification Program. Java Certifications course is a valuable and demanding course in present society. The people who are willing to become a software engineer should be a professional in Java Certification course which would be helpful to him to lead a bright career. Let’s look at the examination process for achieving JavaCertification. The person who is willing to attend Java Certification exam should locate Pearson VUE Test Center which includes proctored / non-proctored master assignments. The person who is willing to attend Java certification exam should set up his web account 72 days before the exam date either at his own location or any other place. Java Certifications exam is held under Oracle Universities. So the person who is willing for Java Certification should follow the directions, select an appointment date for exam & register for the event which is not scheduled. The persons who are disabled require extra time with special assistance during the examination, the person with those abilities can request for test accommodations for authorities during registration of JavaCertification. The students who are willing to receive reimbursement after the completion of the exam should download “Veterans / GI Bill Reimbursement Program Form” fill the form and submit it to the Department of Veterans Affairs. After the completion of the exam, the result can send to the email address the student mentioned during exam registration.